We are so glad to announce the pgBucket 2.0-beta which evolved from its 1.0 version. Also, we would like to thank all of you, who support and gave wonderful feedback about this new tool. This helped us to improve it and make it a bit better. We hope everyone will like the features that we embedded in this new version. In this new version 2.0, we have added features, which will give you more control over the jobs and the daemon process. Now, let us see all the options pgBucket 2.0 offers us. In previous version 1.0, we used to drive the pgBucket daemon by using few environment variables, which are removed in this version. They are maintained in a configuration file now. However, we still need one environment variable called PGBUCKET_CONFIG_FILE, which tells pgBucket about the configuration file location. This parameter tells to the daemon about, where to initiate the socket for the process communications. And this can't reload online. This parameter tells to the daemon about, where to store the process pid file. And this can't reload online. This parameter tells to daemon about, which approach the daemon needs to follow while forking a new OS job process. This parameter accepts only below two values and can be reloaded online. This is the recommended configuration setting for the OS related jobs, where OS will take care of resources which are required for the process clone. This is the regular child process forking mechanism, where we load the new child process image into the newly forked process. Currently, this method is lacking to track of OS job's error messages. This parameter tells to the daemon about, the target PostgreSQL server host address. And this can't reload online. This parameter tells to the daemon about, the target PostgreSQL database name where pgBucket catalogs are created. And this can't be reload online. This parameter tells to the daemon about, the target PostgreSQL server user name. And this can't be reload online. This parameter tells to the daemon about, the target PostgreSQL server port number. And this can't be reload online. This parameter tells to the daemon about, the target PostgreSQL server user's password. And this can't be reload online. This parameter tells to the daemon about, how many source database connections the daemon needs to utilize. And this can't be reload online. In previous 1.0 version, the daemon is utilizing only one database connection, which is used for all the jobs to report their status. If the number of parallel running jobs increases, then each job takes more time in report synchronization. By using this dedicated pooled connections, each and every job may get it's own database connection to report their results into the database. This parameter tells to daemon about, the log file location. And this can't reload online. If the daemon is running in background mode, then it will log all the log messages into the mentioned log file. This parameter tells to daemon about, whether it needs to log the debug messages or not. And it can be reloaded online. This parameter tells to daemon about, how many jobs it needs to dispatch at once. And it can be reloaded online. This parameter tells to daemon about, how many milliseconds it needs to sleep after we reach the dispatch limit. And it can be reloaded online. In previously, we only had scheduled jobs. Now, we introduced continuous job flows as per the job execution status. That is, once a job is complete either pass or failure, we can configure what the next action is based on it's status. We introduced a new job class for each entry in the configuration file. That is, by defining a job in the configuration file we need to mention it's class type with one of the below options. This is the option we need to mention for all our scheduled jobs. That means each JOB class should have a specific schedule. This is the option we need to mention for all our cascaded/event jobs. That means each EVT class should not have any schedule. Here, the job id 1 is configured with the OS command true, which always succeeds and moves to it's event job id 31 (JOBPASSEVNTS = 31). This job is configured to run for every hour. This an event (EVT) job, which tries to insert a record into the database and stores the job's result. The pgBucket daemon generally stores the database result in CSV format. While storing the database query result, it prepends the CSV formatted column names to the results. And, if you do not want to store the column headers, then we need to mention that RECDBRESCOLNAMES = False. You are going to see an advantage of this parameter in further steps. Below is the table description what we created for this demonstration. Here, the job id 32 is an EVT(Event job), which update the build status into our build table. In this job, if you see we have used some special command tags like __pissuccess__. Let us discuss what are all the special tags pgBucket offers, which will be parsed before the job execution. Each command tag will be prefixed and suffixed by two underscore symbols. To parse these special commands, we need to explicitly mention an another job property called PARSECMDPARAMS = True. Job scheduler status returns one of the following schedule status. Whenever we enable the PARSECMDPARAMS, then pgBucket always look for the command tags in the job's command and will replace those tags with its parent(callee) job properties. From the above event job command, we have also mentioned a command tag like 31@__presult__, which is prefixed by an another job id 31. That means, while executing the UPDATE statement, it will fetch the result of job 31, and replace the command tag with 31's result. This is the reason we skipped to store the column names during the execution of the job id 31, by mentioning RECDBRESCOLNAMES = False in job 31's configuration. Here, the job id 33 is configured as to create a brand new folder in /tmp/ and clearing the previous entries using rm command. Once this command is successful it goes to it's event job 34, otherwise it goes to 32, where 32 will replace all the command tag details with 33's result. For demonstration purpose we have added JOBFAILIFRESULT = NONE, where job result will be compare with this parameter value, and then change the job execution status as failed if the output is equal to NONE. Here, the job id 34 is configured as to pull the pgBucket source from bitbucket and then do checkout to a branch called eventjobs. If this is succeeded then, it goes to event job id 35, otherwise it goes to 32. Here, the job id 35 is configured as to process the make command by exporting the pg_config path. If this is succeeded then, it goes to the event job 36, otherwise, it reaches to job 32. In this job configuration, we have mentioned a new feature called Auto job disable using DISABLEIFFAILCNT = 3 option. That is, if this job fails continuously 3 times, then this job will be disabled automatically, and the job flow will end here whenever the job id 1 starts it's execution next time as per its schedule. Here, the job id 36 is configured as to test whether the pgBucket binary works or not. If this job is succeeded then it goes to job id 32, otherwise it goes to 32 and then update the result of 36, and then start a fresh build process by going to 31. A simple pictorial representation of the above process as shown below, and hope it gives you more idea about what we are trying to achieve here. In the below diagram, RED LINE indicates the job failure path, GREEN LINE indicates the job success path. Please be aware of stack size configured at OS level. Thread stack may get overflow during the deep event job recursion and may lead to daemon crash. A sample run for the above demonstration is as below. 2017/4/30 10:31:1 IST NOTICE  Event Job id ->31 is completed with PID(5327) with duration 0 seconds. 2017/4/30 10:31:1 IST NOTICE  Event Job id ->33 is completed with PID(5328) with duration 0 seconds. 2017/4/30 10:31:18 IST NOTICE  Event Job id ->34 is completed with PID(5331) with duration 17 seconds. 2017/4/30 10:31:31 IST NOTICE  Event Job id ->35 is completed with PID(5339) with duration 13 seconds. 2017/4/30 10:31:31 IST NOTICE  Event Job id ->36 is completed with PID(5469) with duration 0 seconds. 2017/4/30 10:31:31 IST NOTICE  Event Job id ->32 is completed with PID(5471) with duration 0 seconds. Let us get the job 1 status by using job's status command as shown below. pgBucket is inspired by the psql's extended table format, and we got a chance to extend it even more. That is, we can mention how many columns we want to display rather a single column. For example, consider the below output. From the above example, we have retrieved 3 records(-L) and printed 2 columns(-e) for each row. We can also mention the number of columns we want to print by using -e option. An another example of the same extended output is as below. In this version as we introduced a dedicated configuration file, and we can change the daemon settings online and we can reload the daemon settings using -o option. In this version, we have introduced a new job-related parameter called, DISABLEIFFAILCNT which a job will automatically disabled if the count of continuous failure reaches to this parameter. In this version, we have introduced a new job-related parameter called, JOBFAILIFRESULT which a job will treat it self as a failure when the result of job execution match with this setting value. Besides to the above-mentioned features, we have improved the pgBucket daemon stability and improved a bit coding standards. This is a simple concurrent job scheduler of a database server. That is, using this tool we can schedule either OS jobs or DB jobs by using a cron style syntax. This tool is implemented using c++11 (gcc 4.9.3). The pgBucket internal implementation is as like below. All today scheduled jobs will be loading into a job queue which is followed by a job hash instantiation. Here, job queue is divided into 4 buckets and while loading jobs from hash into the queue, jobs will be going into their respective buckets based on it's next dispatch time. 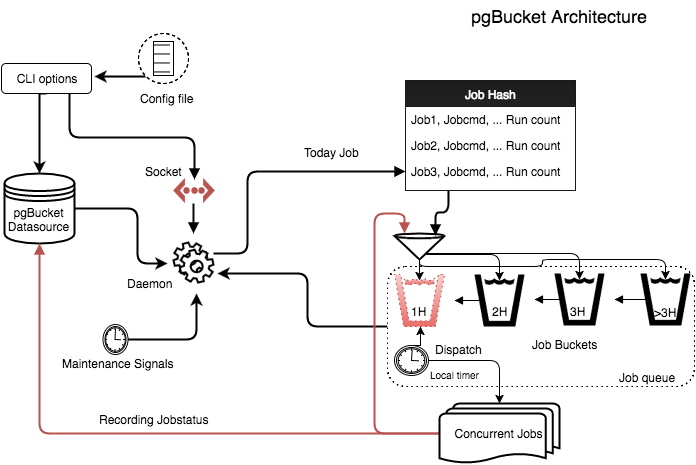 The pgbucket dispatcher is always pointed to the 1Hour bucket, and in the interval of 1 second, it is looking for the jobs to dispatch from the 1Hour bucket. Once any job is dispatched, then it is job's responsibility to complete the given task and report the status along with result to the data source. After spending 1Hour time that is 3600 seconds, the daemon will merge the 1Hour bucket with 2Hour bucket to get the latest jobs to dispatch. Also 2Hour, 3Hour and GT3Hour(Greater Than) buckets will be updated accordingly. At every day beginning second, that is at 0 hours 0 minute 0 second the instance will be refreshed automatically. Now, let us see how to build this tool and how to use it. To run pgBucket we need data source details. We can either set the libpq environment settings or we can use pgBucket cli options to define the data source. I would encourage you to set them as environment variables as like below. Now let us see the usage of pgBucket options. This option initializes the pgBucket catalog tables in the given data source. This option drops the catalog tables. This option specifies the jobs config file. This option runs the pgBucket as daemon process. This option provides the SOCK DIR path. This option will quit the daemon. This option needs further options which will provide more information about configured jobs. This option specifies logfile location. This option needs further options, which will work on daemon instance. RN  -> Run a job normally. If any job is disabled/skipped it's nextrun then this option won't force the given job to run now. This option will run the given job forcefully. This option will enable the job only for today. Since, the instance will be re-instantiated for the nextday. This option will disable the job only for today. Since, the instance will be re-instanced for the nextday. This option won't work on db level jobs. Because, we are killing db connections using pg_terminate_backend. This option prints the current job queue. This option prints the current job hash. This option will skip the job's next run. This option will limit results while printing the tables. This option will work only with "-S*" options. Default limit value is 10. Using this option we can insert jobs into data source/instance from the config file. Using this option we can update job into data source/instance from a config file. Using this option we can delete a job from the data source, and will be cleared from instance once it is re-instantiated. This option takes the jobid. This option will run the daemon in DEBUG mode. This option will provide data source hostip. This option will provide data source username. This option will provide data source database. This option will provide data source port. This option will provide data source password. This option defines the local socket directory. This option defines the local pid directory. pgBucket requires data source to keep the configured job's information as well as job's results. Create a config file with our required jobs as like below. For demonstration, let us some prepare some sample jobs and then push to the data source. * Jobs parsing is started..
* Pushing jobs to database..
Now let us see whether jobs are registered or not. Let start the daemon process with a logfile. Let us tail the log file and see what it is writing. 2016/7/3 17:40:3 IST NOTICE  Jobid -> 3 is completed with pid(5675) with duration 3 secs. 2016/7/3 17:40:10 IST NOTICE  Jobid -> 4 is completed with pid(5679) with duration 0 secs. 2016/7/3 17:40:20 IST NOTICE  Jobid -> 4 is completed with pid(5684) with duration 0 secs. pgBucket provides a way to deal with the running daemon process via a socket. Now let us go and see the job queue instance, and check what are all the jobs are ready to dispatch. * Connected to local socket..
Also, let us see the job hash instance, and check the job's live metrics. From the above table, we see the jobs 1,2 are INITIALIZED but not SCHEDULED. Since, these job's are configured to run today but it's scheduled time is already completed. We can also track the job status from the data source. Data source gives us more flexible options. Now, let us get all the job's execution status as below. Seems, we got only the latest 10 rows from the data source which is the default rows limit. If you want to get all the job's results use -L along with -S options. Use -1 if you don't want to limit the number of rows. As there is a way to communicate with the daemon, we can tell to the daemon to run the given job manually. For example, let us run the jobid -> 1 which is scheduled to run every day mid night. * Jobid -> 1 is dispatched. From the above message, it is saying that the jobid -> 1 is dispatched. Let us validate it's status from hash and data sources. From the above table, it seems our job is executed successfully. Let us validate the same from data source also. Now let us see the script, and validate whether the dump file is generated or not. To configure a new job or update an existing job we have to use the jobs configuration file. For example, let us insert a new job which tracks the current database sessions from pg_stat_activity. So, append a new job entry in the existing config file like below. Now, let us insert this job into data source and instance as well. * Jobid -> 1 already exists. Skipping it..
* Jobid -> 2 already exists. Skipping it..
* Jobid -> 3 already exists. Skipping it..
* Jobid -> 4 already exists. Skipping it.. Seems it skipped the existing jobs and processed only the new job. Now, let us validate it from data source/instance. From the above results, we can see that the job is dispatched 7 times and it's "Prev Run Status" is Fail. Now let us validate the same from the data source. Ah, seems we have a syntax error in the given SQL statement. Let us update the same job by fixing the sql statement in jobs.config file. * Given job -> 5 is not matching with config file job -> 1. Hence, skipping it ..
* Given job -> 5 is not matching with config file job -> 2. Hence, skipping it ..
* Given job -> 5 is not matching with config file job -> 3. Hence, skipping it ..
* Given job -> 5 is not matching with config file job -> 4. Hence, skipping it ..
Now let us validate the both data source and instance. Seems we fixed the jobid -> 5 syntax issue. pgBucket stores the OS job's output as it is in the data source, where as DB outputs will be in CSV format. For example, if we want to see the jobid -> 5 output we have to use it's "serial id". "Serial id" is nothing but job's execution sequence number. We can get this "Serial id" while getting the jobs from data sources. From the above example, let us get the output for the serialid -> 781. We have added (-R) refresh as an addon utility to pgBucket which will do an online re-fresh of the complete pgBucket instance by creating a new job hash and job queue instances. However, it won't disturb the currently running jobs. All running jobs will be managed concurrently. Let us refresh the instance once. From the above details, we see that all job's schedule status set to "INITIALIZED" and run count set to 0. Let us validate again after a couple of minutes. We can enable/disable a job using either updating the job.config file or we can also do this at the instance level. If we disable a job in an instance, it will be re-enabled while we do an instance refresh. So, please make a note of it before doing any job disable at the instance level. * Disabled the jobid -> 1 in an instance. I am thankful to my wife Manoja who gave me a great guidance and support to make this tool more effective.